This island ranks #4 of the "Best atolls in the Maldives"
Filitheyo Island Resort is the only island resort in the atoll of Faafu. 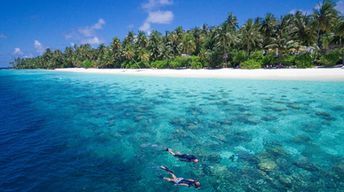 As for inhabited islands, the choice of accomodation options is great, while the fares are below the average standards in the Maldives. And after all of that, there are bikini beaches everywhere, so you won't have to take expensive excursions. Fly to Maldives international airport (MLE). Next get by a seaplane (30 minutes) or by public speedboat (2.5-3 hours per way). The round trip transfer by seaplane is about US$500-600 per adult and US$300 per child. While the ticket fare for the speedboat is US$40-70 per person per way. The best time for a holiday on the beaches of Faafu atoll is a dry cool season in the winter half of the year.